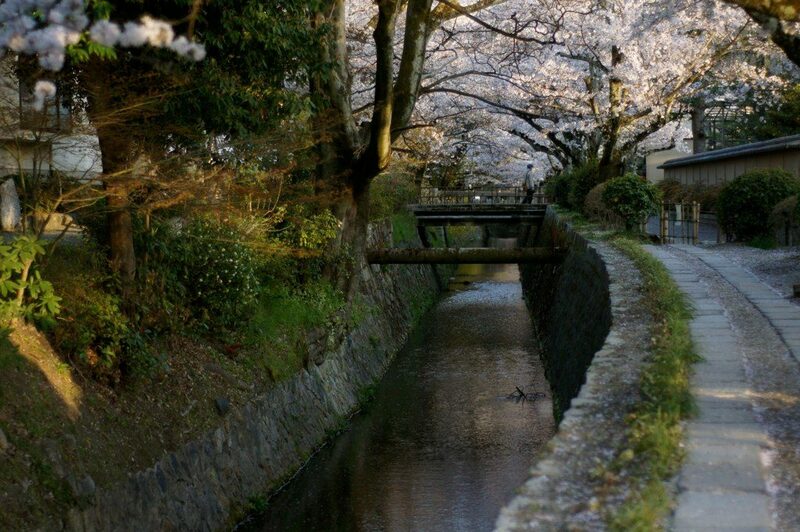 The Philosopher’s Walk is a shorter foot path in Kyoto. 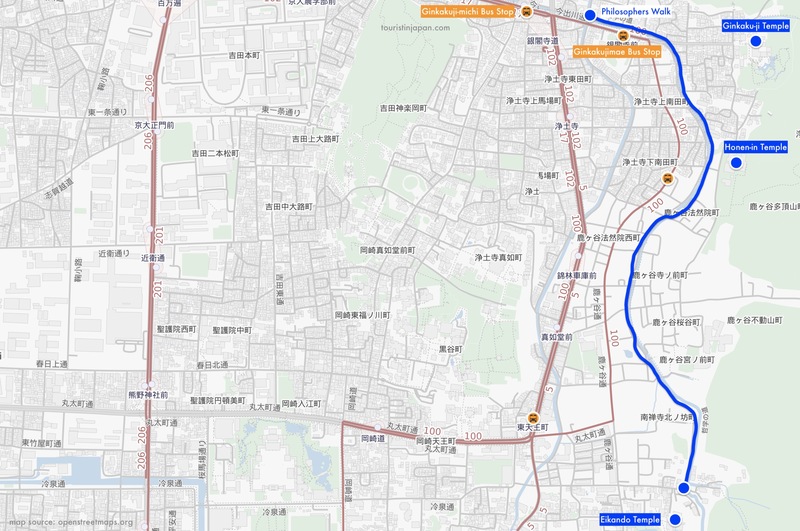 The path is just under 2km (1.2mi) long and runs along a canal at the foot of the Higashiyama mountains. The Philosophers Path, as it is sometimes called, is lined with beautiful cherry trees. 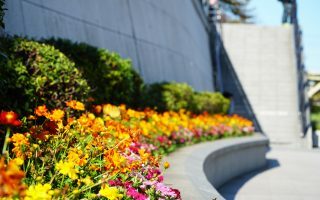 During spring, when the blossoms are out, this path attracts quite a crowd. 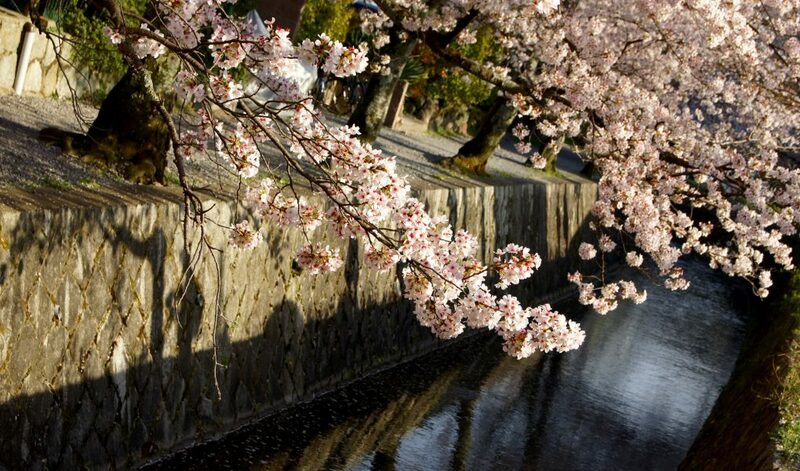 It is one of the primary spots for cherry blossom viewing (hanami) in Kyoto – and with good reason. With each gust of wind the delicate sakura petals fall, creating a soft pink blanket on the ground and turning the canal into a beautiful stream of pink flower petals. It is truly a scenic place during sakura season. The Philosophers Walk runs between Ginkakuji (the silver pavilion) and Kumano-Nyakuoji Shrine. 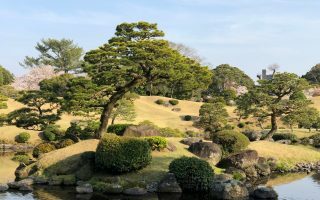 Along the way are other attractions, like Honen-in Temple, Anraku-ji Temple and just south of the end are Nanzen-ji Temple and Eikando Temple. With many sights to see along the path, at least 1.5h should be scheduled for a stroll here. If walking straight through, with no stops the walk is about 30 minutes. Philosophers Path. Credit: Andrew Markle. Licensed under CC. It is said, that the path along the canal used to be a regular, non-spectacular, footpath until 1921 when a local painters wife decided to plant 300 cherry trees along the path. Along this path, a local Kyoto university professor by the name Nishida Kitaro (1870-1945) would walk to work every day. He was one of Japans greatest philosophers, and it is thought that he would meditate while taking his daily commute on this path. During second world war the path was neglected and desolated, and the city of Kyoto planned to remove it. Local protests stopped these plans, and in 1972 the beautifully restored Philosophers Walk was reopened. It wasn’t till this time that the path was named Tetsugaku-no-michi (literally: path of philosophy). 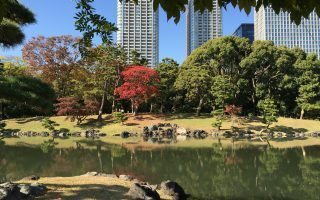 By bus: from Kyoto station, take bus 17 to Ginkakuji-michi Bus Stop or bus 100 to Ginkakujimae Bus Stop. Cover photo: Luca Mascaro. Licensed under CC.